George Dobell is the Senior Correspondent at ESPN Cricinfo and one of our favourite journalists. Along with Steve James, Mike Selvey and Derek Pringle, his is one of the columns we always look out for, and he hits the mark from a different angle from most cricket writers. It's not all one way traffic either and we caught up with the man recently and waxed lyrical about all things from keying up cars, to drinking rum, to what really goes on in the press box as well as Jennifer Lopez' culinary skills. Have a chuckle with the banter from one of the funniest people out there covering the game of cricket. Just don't get into a car with him! TMS: George, as a man who has travelled the world covering England, and one of the finest writers out there covering the sport, it must be a huge privilege to be interviewed by The Middle Stump? GD: Honestly, it is the greatest moment of my career, although saying that, that isn't the greatest accolade! Actually I was about to get dragged shopping at Tesco's so you have saved me there. TMS: Every Little Helps George! 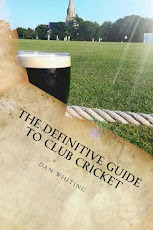 You've just read our book Cricket Banter haven't you? GD: Yeah I really enjoyed it. It is a funny, unpretentious read and will make an ideal Christmas present. There's no money in books any more unless you are JK Rowling or Delia, but next time chuck in a few omelette recipes or boy wizards. I actually read some of it when my car broke down and I was waiting for the AA. It was a great read and the time flew by. TMS: Do you still play yourself? GD: Not really, I had a couple of bad car crashes so not much but I am playing next week for the Wisden 150th anniversary. I play for the Cricket Writers too, and played in Barbados recently in a 6 a side. Nothing more encompasses the decline of cricket in the Caribbean than myself and Charlie Dagnall opening the bowling out there. Fire in Babylon? More Smog in Tescos Car Park! Writing is second best, and nothing beats playing. TMS: Who are your favourite other journalists? GD: I love the Press Box at Taunton, it's great fun. Steve Cotton down there is a good laugh as is Tom Guest at Worcester. They are seriously funny guys. As for the guys you have to read then I would say Nick Hoult in the Telegraph and Paul Newman in the Daily Mail. At ESPN Cricinfo, I love it there and we have a great bunch to work with too. TMS: Why is the Press Stand at Edgbaston alcohol free? I have never heard of more of a misnomer for a stand! GD: I don't know if cricket journalists do drink to be honest. I struggle to find people to keep up with me! You can't drink in the day any more, if you missed something it would look really bad. Back in the day, they did serve it in the press boxes. My favourite day ever was in 2001 and it was the C & G final where Somerset beat Leicestershire. It was also the day England beat Germany 5-1. The till broke in the box so they had to make it a free bar, so I invited my father and brother in and we took full advantage. What a day! Apart from meeting JLo, who would then say, "I'd like to cook steak for you naked", it really couldn't get much better. TMS: Who can drink the most and the least amongst the press? GD: Me the most with rum. I wish I could monetize it, you know, go professional! I once did a pro rugby player in a drink off, and still have the photo of him comatose with me sitting on his chest. The least would have to go to Chris Stocks at Metro. We went out one night in Dubai and we didn't see him for two days afterwards. He is so light weight that you have to tether him down in case he floats off! I told you, I give 'em nothing! TMS: Who is the quickest bowler you have seen? GD: Shoaib Akhtar or Shaun Tait. Tait less often, although the spell he bowled in the T20 final when we won it was rapid. KP charged him and put him over extra cover, which broke him and changed the game. It was then I knew KP had gone from a very good to a great player. GD: All of them. Variety is the spice of life. When it is not a thrill I will give up. Every ground has their differing cultures. The Oval is wonderful, as is Lord's. I love Taunton, Edgbaston, they're all different. TMS: What do you like about your job? GD: Well I don't have many skills really. I could turn to crime but I am too honest. I don't have the ability to do anything else and I am lucky to have a job that pays ok and I hang out with nice people. I feel a bit like Bernie Madoff and it will all catch up with me one day! I love what I do, and I couldn't work in an office and pretend to look busy. I did that. TMS: Who is the most press friendly cricketer in England? 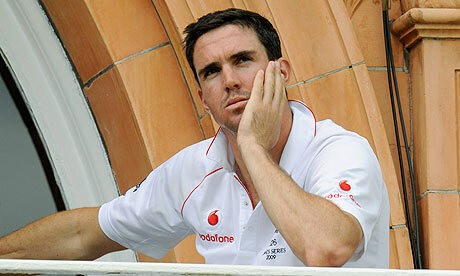 GD: KP is gold dust. At Leeds last year after that famous, or infamous press conference he whispered to the Press Officer, "Told you, I give 'em nothing". Swanny is good as he enjoys it. Darren Sammy is good too, and is such a nice bloke he makes Jesus look like Fred West! Not sure he can heal the sick but he would give you his lunch. Whether he can turn it into feeding five thousand people or not remains to be seen? Sammy...about to walk on water according to George! TMS: What is your view on T20 cricket? Are the public getting bored of it? GD: No, I enjoy it. I think it has been poorly marketed in the past though but it will be better in England on a Friday night. Hopefully it will appeal to wider audience, and they will understand the nuances of the game. You can't compare it to the longer game. It's like KFC v the finest seafood. Or Jennifer Ellison v Audrey Hepburn. The other day both myself and my girlfriend brought back DVD's to watch. I brought back Il Postino and she brought back American Pie 2. We enjoyed them both. I would like to see it as a knockout competition on free to air tv though and I also think franchises are a terrible idea. TMS: I agree. Why should say the likes of Somerset who are well supported, have to merge with Gloucestershire and the fans have to travel up to Bristol under a franchise? I also think we need to encourage kids whose parents can't afford Sky TV to watch cricket. GD: Exactly. I think it will happen with regards to the free to air tv. We should embrace what we do in England. Only our T20 and the IPL don't lose money. We do things well in this country. TMS: What was India like last winter? GD: It was a wonderful opportunity and a wonderful series. There were aspects of it which I had been warned about, but which still shocked me such as the poverty. Some aspects were distressing but others were wonderfully humbling. Also to see KP's knock in Mumbai was a privilege. TMS: Best sledge in your experience? GD: It happened to me personally. I was playing in this game and this bloke was giving me some grief. I got him out, caught by my brother and we laughed at him. After the game he was still pissed off and keyed a black BMW in the car park. He keyed every panel and the damage must have run into the thousands. I drove a black BMW but unfortunately so did his skipper, and he'd only gone and keyed his skippers car! TMS: Best food on the circuit? GD: Edgbaston. We had these two girls giving us massages and because our hands were busy, they were feeding us strawberries dipped in chocolate. You can't complain at that can you? TMS: Best three youngsters coming through in the country? GD: Jamie Overton, Sam Robson and Luke Wells. TMS: What do you think of the charity Factor 50 and the work they do educating young players? GD: Brilliant and Gill Nuttall is an inspiration. She makes me feel shallow and vacuous. I got sunburnt recently in Barbados and felt I had let her down. Not sure which was more painful, the sunburn or the sense Gill would be disappointed. She's a great woman! TMS: What is your prediction for the Ashes? GD: I shouldn't make predictions as I did say that we would beat Pakistan 3-0 in the UAE and that Frank Bruno would unify the world heavyweight title. However, with the caveat that I shouldn't make predictions, I will go for 10-0 to England. I really think we are better and in KP, Cook and Swann we have three great players. TMS: What are the plans for the future? GD: Good question. I love what I do working for ESPN Cricinfo, so there is nowhere I would rather be. I'll keep putting words in good areas. I go to some lovely places and I am lucky that I write on the best England team in my lifetime at present. I'm not very talented as I mentioned but I would love to write a film. Either that or open a rum shop in Barbados! TMS: George, it has been an absolute pleasure and when you come up to North London we'll have a couple of rums? GD: Definitely. We'll go to Camden and hit the rum bars there. The Spiritual Bar or Cottons are the places. I'll give you a shout. And with that, we left him to go on his merry way. And what a nice bloke he is too! Great interview. Thoroughly enjoyable but did he do it for free? I hear he charges a hefty appearance fee given the demand! He will charge us in rum! It will cost us a fortune no doubt given his imbibing ability. For he's a jolly good fellow (that GD).